This past week, Apple’s annual Worldwide Developer’s Conference (WWDC) demonstrated Apple’s commitment to introducing successful iOS features to other platforms. Apple revealed three major new products: Mountain Lion OS X, iOS 6, and the new MacBook Pro. While Apple also revealed new SDKs (Software Development Kits) for iOS and Mountain Lion, the first three products represented the most significant additions. Each one of these developments shows another manner in which Apple is building from its mobile platform to its other devices rather than from its computer platform. Take Mountain Lion for example: many of Mountain Lion’s features make it more similar to iOS. According to Apple’s presentation, all apps will now run on all Macs, enabling casual gaming’s expansion to more devices. Perhaps the most convincing evidence of Apple’s push to integrate successful mobile features with all of its devices is that OS X updates will now happen via the App Store, consolidating Apple’s distribution to a single place. This singularity of its distribution methods solidifies the strength of Apple’s App Store, which recently wrote a check for $5 Billion dollars to its developers. A more detailed description of new features can be found here. The iPhone and the iPad are now the hubs of your daily operations, and the widespread anticipation of iOS 6 supports this observation. Some of its new features include updated map software, a gift card/coupon/ticket/loyalty card app that consolidates these functions to one place on your phone, and an improved lost-phone-locator app. In addition to all of these functions, iOS 6 offers increased functionality for Siri, Apple’s voice activation software that is already active on all its devices. All of these functions suggest that Apple wants your iOS devices to be the center of your daily routine. Apple’s new MacBooks are also incorporating iOS technology. The biggest improvement to the new MacBook is the retina display on the 15-inch MacBook. This technology is already present on the iPhone 4S & the iPad 2, and the arrival of a retina display MacBook demonstrates the increasing similarity of Apple’s devices to each other. The most plausible reason for Apple’s trajectory is that Apple’s strength with developers and consumers is its uniformity. 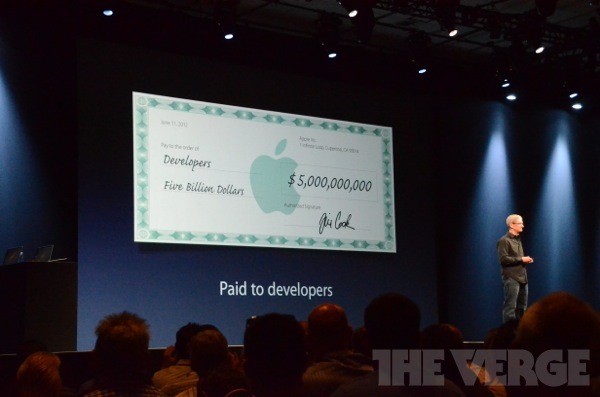 According to its WWDC keynote, there are 365 million iOS devices worldwide, including 66 million Mac users. As we wrote in our last post, companies requesting apps often push for an iOS version first because the platform is the easiest for which to develop, and iOS apps can reach the entirety of this massive audience. Apple’s increasing uniformity cements its place as the simplest platform with which developers can work.